As many of my readers know I have quick only skin so I am always on the hunt for the next new foundation that claims to be mattifying and long lasting. 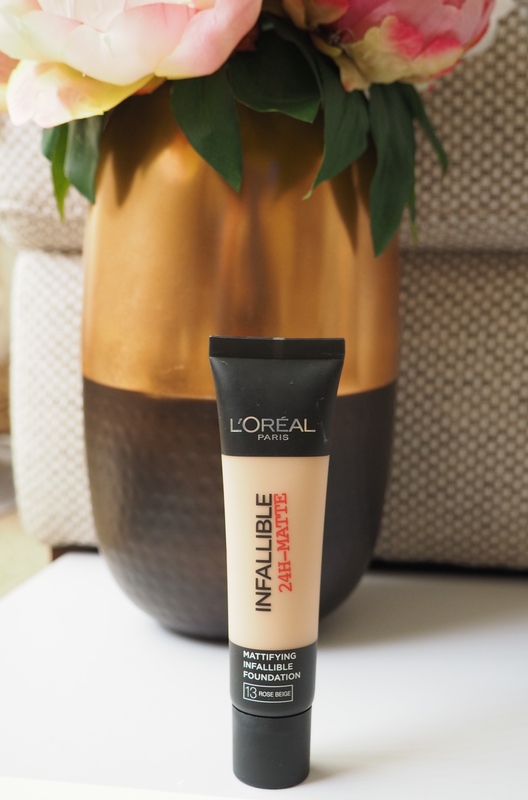 When the L’oreal Infallible 24 Hour Matte foundation came out I knew I had to get my hands on it quickly! I bought this about 2 months ago now and I really wanted to give it a good old work out before I made my mind up and told all of you what I though about it. Well I have given it a serious work out and I have to tell you it is a miracle! First lets talk about the application, I still use a primer so my foundation really has a good chance at lasting then I apply this with my favourite Sigma Flat Top Kabuki. I really work it into the skin so it looks seamless, it blends super easily and has a brilliant amount of coverage. As I have fairly patchy blotchy skin so I really needs something that covers all of my red spots and this really does, it one layer it truly evens out my skin tone which also means I don’t need to use as much concealer on my face. Bonus! Now I have read a few reviews of this and many people don’t seem to use powder with this, but I just can’t do that I need to know that my t-zone isn’t going to look like a shiny disco ball after a couple of hours so I put a light dusting of powder on my t-zone and it really makes it all stay in place. This is the most important part – the lasting time! To truly test this out I wore this on one of my really long days that involves a lot of travelling and walking quite a distance. I am telling you by the end of the day it was still all there without looking cakey, most days I don’t have a chance to freshen up my makeup I normally just use the cheapo university toilet paper to blot my nose and keep on going. So the fact that this lasted all day with only minimal oil breakthrough is an absolute miracle to me. Plus it didn’t cling to my dry patches at the end of the day either! All in all I think this is definitely my new favourite long lasting matte foundation, I can’t wait to see how this holds up in the summer as well! I also think this will be a staple in my travel makeup bag, something that is easy to apply and lasts all day without any touch ups, this baby is definitely coming to Europe with me! Have any of you tried this foundation? What did you think?